You've heard the buzz about this thing called Permaculture, but never really found the time or had the opportunity to have it explained? Then this jam packed free, one hour lunchtime workshop is for you (also live screened to facebook). Bioenergy, Australia's largest, most cost-effective and versatile renewable. 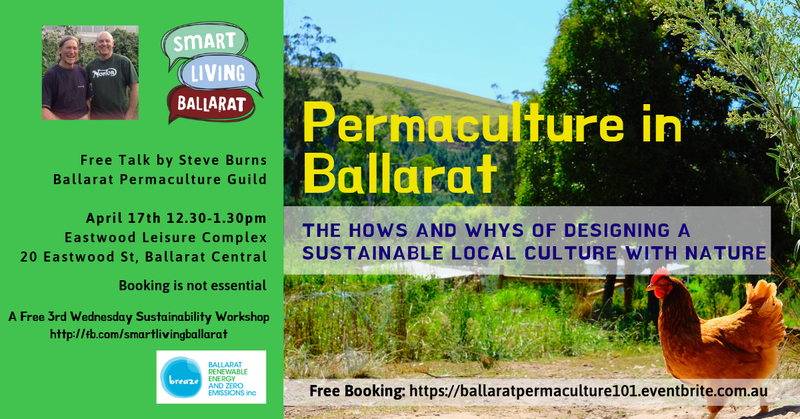 Smart Living Ballarat in association with BREAZE Inc. is providing this free one-hour sustainability-themed workshop. The workshops are presented every 3rd Wednesday of the month at Ballarat Library. Andrew Lang is a farmer and farm forester in the Western District of Victoria, Australia, managing about 130 hectares of multipurpose farm sawlog woodlots. Practical DIY, Trade assisted retrofits & eco ideas to save you $$$. How to assess your unwanted energy losses and gains. Hands-on demos and of DIY materials and solutions. What do you do with all your excess homegrown fruit and vegetables? Come and learn the basic differences between the various home preserving processes & methods such as pickling, fermenting, sweet jams, hot bottling & freezing. Come and hear local eco-group representatives introduce and describe their activities. A chance to network, join in, make plans and celebrate a year of Smart Living in Ballarat. Passive House is a globally recognised building construction standard. It is relatively new to Australia and delivers year-round thermal comfort and excellent indoor air quality with minimal energy input. Detailed building physics calculations along with rigorous construction-stage verification ensure the outcomes are predictable, verifiable and accurate. As we continue to seek answers to our growing waste problem, there is much that we can all do to bring about the revolutionary changes that we need to make. Come and hear about some of the innovations, behavioural changes and simple solutions that are already happening, along with the challenges we have yet to tackle.